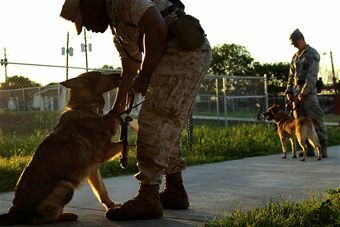 Three airmen from Patrick Air Force Base, Fla., were honored Saturday for their work with military working dogs, although canines were the real center of attention. Florida Today reports that Tech. Sgt. Justin Sonnier, Tech. Sgt. Jessica Sonnier and Staff Sgt. Michael Moret received medals from the U.S. War Dogs Association at the Veterans Memorial Center of Brevard County. The center showed off its new tribute to military working dogs: a life-sized bronze statue of Brutus the war dog standing next to an empty helmet, atop a granite marker. Maj. John Newton, commander of the 45th Security Forces Squadron at Patrick, also spoke at the event.